Here’s the lowdown. Since I had the recipe and photos waiting in the drafts, I had completely forgotten about how amazing they were and so (of course) had to make them again. There’s no stopping me when it comes to the big wide world of donuts. Or peanut butter, but that’s a different story. 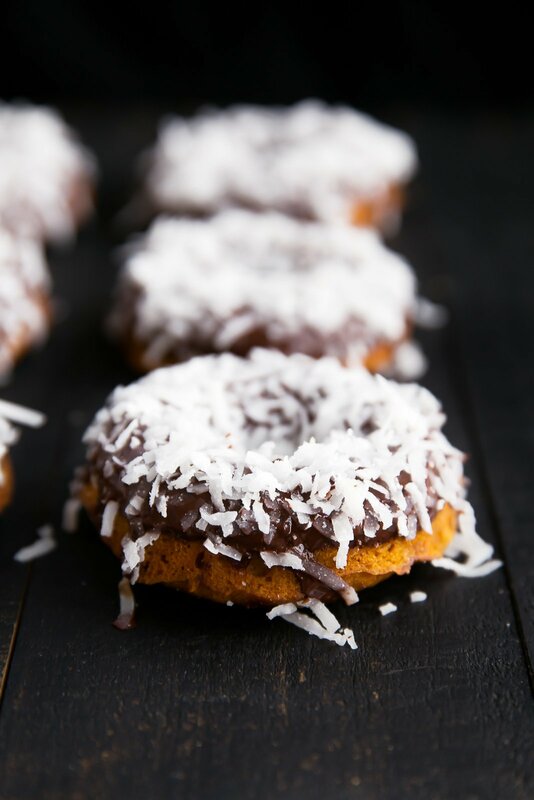 Before we get into the details of these amazing sweet potato donuts, I need to mention that you’ll need a donut pan to make these. If you don’t have one, the real question is: what are you waiting for? They’re inexpensive and most baked donut recipes are done in roughly 15 minutes! Donuts truly make the most wonderful homemade brunch accompaniment with a pot of coffee and a giant pitcher of mimosa. These are the kind you dunk in a steaming hot cup of coffee or foamy almond milk cappuccino. They’re hearty, yet still have a light and tender interior which makes you forget about the fact that they’re baked instead of fried. Whole wheat pastry flour or white whole wheat flour provides a wonderful source of whole grains so you really can’t feel too terrible about enjoying one (or two!). They’re also dairy free! I actually just realized that most of my recipes are, so tell all your DF friends to come say hi. They only take less than 30 minutes to make. Okay, that’s enough talking. It’s time to go make donuts people. Get to it! If you make this recipe, be sure to tag #ambitiouskitchen on Instagram so I can see your lovely creations! xo! In a separate bowl, mix together the sweet potato, maple syrup, egg, coconut oil, almond milk and vanilla extract until smooth and creamy. Add wet ingredients to dry ingredients and mix until just combined. 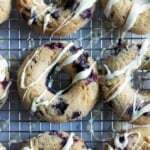 Avoid over mixing here as it can make the donuts tough instead of light and fluffy. Spoon the batter into the donut pan, filling almost to the top. Bake for 11-14 minutes or until cake tester comes out clean. Turn the donuts onto a wire rack to cool completely. Once donuts are cooled, melt chocolate in a small saucepan over very low heat; stir continuously until chocolate is melted. Once melted, transfer chocolate to a warm bowl and dip each donut in the chocolate, then transfer to a wire rack. Repeat with remaining donuts. 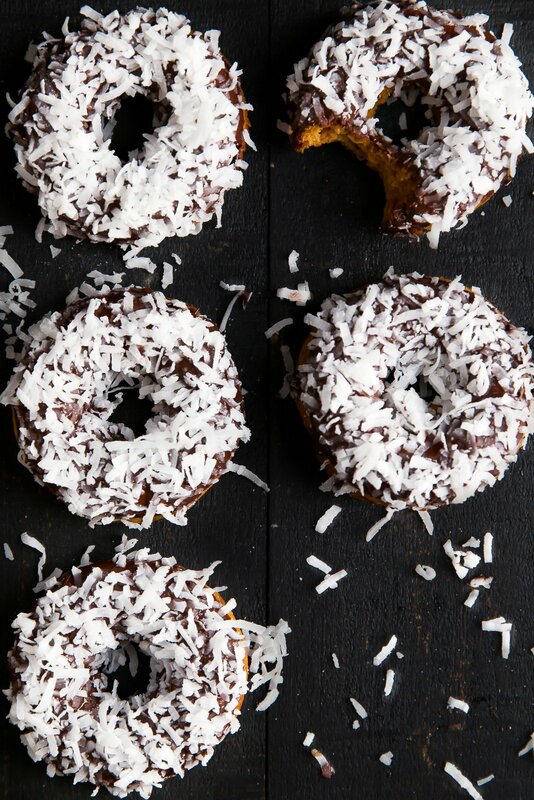 Immediately top each donut with a tablespoon of coconut flakes. Instead of the dark chocolate, you can use 1/3 cup of chocolate chips. 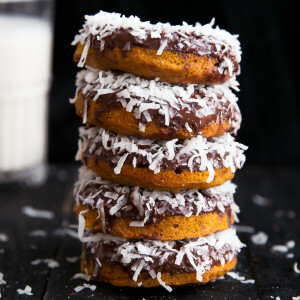 42 Responses to "Baked Sweet Potato Donuts with Dark Chocolate + Coconut"
I’m one of those people who NEED a donut pan. Like asap so I can make these because my mouth is already watering. Also, I’m surprised I haven’t turned orange with how many sweet potatoes I consume. What can you use instead of a donut pan? Any ideas? Has anyone tried these with a gluten free flour? These look amazing! I too am interested in making these gluten free as I have a family member I would love to include! Thanks!! Oh I NEED these with my morning coffee! Sweet potatoes and coconut? I’m IN! i’ve been trying to resist the temptation of a donut pan for years (there’s so many pans everywhere and there may or may not be cake pans in my bedroom closet), but i’m not sure if i can last much longer. 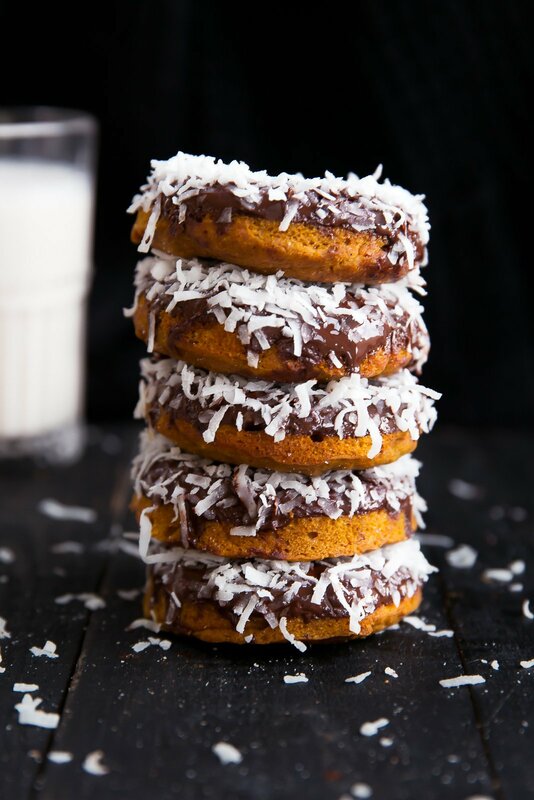 the sweet potato, chocolate and coconut combo just sounds too good! Like many who will want to try this ASAP, I don’t have a donut pan. Has any one tried baking them in cupcake pans? If so, did you adjust the time? These look incredible, and I am hoping to make them this evening. I love this idea! 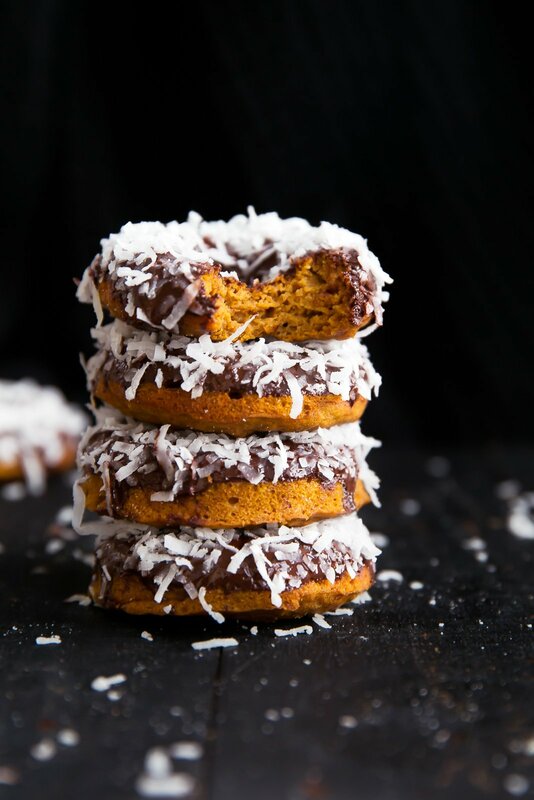 Putting sweet potatoes in donuts to really soften the batter while adding a lot of vitamin A, fiber and potassium into the recipe would be incredible! How much ginger did you add? It’s not in the ingredient list. Thanks! So sorry! 1/4 teaspoon. I will update now. Thank you! 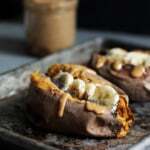 You had me at sweet potato! These look amazing dear! 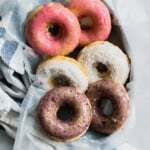 I just bought a couple of donut pans on sale from World Market recently and have been looking for a healthier donut recipe to break them in. Plus I love sweet potatoes and coconut. These sound perfect! Do you think I could use honey instead of maple syrup? I really want to make these asap. 3 years later… I used honey and the donuts were incredible! Hi! 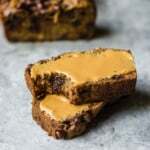 These look amazing and I am definitely going to make them! Did you use sweetened or unsweetened coconut flakes? These look absolutely delicious ! 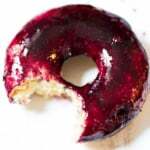 I have been craving donuts and these would be great to have a healthier treat! My son is allergic to dairy and coconut, so the olive oil option was much appreciated! I topped them with Justin’s chocolate hazlenut butter and sprinkles… Total winner… Must make more! And now, with a little planning on the part of his mum, he can enjoy donuts with the rest of the family on vacation. 🙂 Thank you for posting this recipe!! Hi Monique! 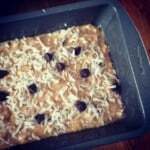 Do you have any good suggestions for GF flour to use for this recipe? They look AMAZING!!! I made my own gf version of these today. Used 1/4 cup almond flour and 2/4 bob’s mill gluten free flour. Added an extra egg. They are delicious! I made it with an AP gf flour and the batter was very thick so additional liquid is probably needed. 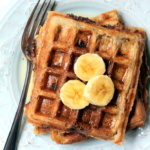 I also opted to make it in my waffle iron and they were awesome. I’d definitely make it again and continue to modify with gf flours and the amount of liquid. Vegan option without egg? Linseed meal? Do you think you could use pure pumpkin instead of the sweet potato or mashed bananas or exchange some of the flour for cocoa powder? I bought a donut pan a few years ago but haven’t used it because I hadn’t found a healthy enough recipe. I am so excited to be making this recipe today…it is a dandy! I made these little gems, so easy, so yummy, your going to love them!!!! !